List of Contributors R. Michael Alvarez is Associate Professor of Political Science at the California Institute of Technology. Most of his research and teaching focus on the study of electoral politics in the United States. He is the author of Information and Elections (University of Michigan Press, 1997) and numerous articles in scholarly journals. His current research projects consider American public opinion about divisive social and political issues; voting behavior in primary elections; and the causes of gender differences in opinions about economic issues. He was an expert witness for the State of California in California Democratic Party v. Jones and was an outside consultant for Knight Ridder on its 2000 Hispanic Voter Poll. Mark Baldassare is a Senior Fellow and Program Director in Governance at the Public Policy Institute of California in San Francisco, where he holds the Arjay and Frances Miller Chair in Public Policy. He currently directs the PPIC Statewide Survey, a large-scale public-opinion project aimed at developing an in-depth profile of the social, economic, and political forces that are at work in California elections and that shape the state's public policies. Baldassare previously held the Roger and Janice W. Johnson Chair in Civic Governance and Professional Management at the University of California at Irvine. His most recent book is California in the New Millennium: The Changing Social and Political Landscape (University of California Press, 2000). Shaun Bowler is Professor of Political Science at the University of California, Riverside. His major research interests concern comparative voting behavior. His work examines the interaction between institutional arrangements and voter choice in a variety of settings, ranging from the Republic of Ireland to California's direct democracy elections. Additional interests of his include assessing the effects of campaigns on voter choices (he coedited Electoral Strategies and Political Marketing) and the European Parliament. He is coauthor of Demanding Choices: Opinion Voting and Direct Democracy (University of Michigan Press, 1998) and coeditor of Citizens as Legislators: Direct Democracy in the United States (Ohio State University Press, 1998). Bruce E. Cain is Robson Professor of Political Science and Director of the Institute of Governmental Studies at the University of California, Berkeley. In addition to his numerous journal and law review articles, he is the author of The Reapportionment Puzzle (1984), coauthor of The Personal Vote (1987) and Congressional Redistricting (1991), and coeditor of Developments in American Politics, vols. I (1992), II (1994), and III (1998). He has served as a polling consultant to Fairbank, Canapary, and Maulin (1985-86) and as a redistricting consultant to the Los Angeles City Council (1986), the San Diego City Council (2001), and the Attorney General of the State of Massachusetts (1987-88). He has been a consultant to the Los Angeles Times (1986-89) and is a political analyst for numerous radio and television stations in the Bay Area. Professor Cain was elected to the Academy of Arts and Sciences in March 2000 and received Stanford University's Zale Award for Distinction in Scholarship and Public Service in May 2000. He was an expert witness for the parties in California Democratic Party v. Jones. Miki Caul is Assistant Professor of Political Science at SUNY Binghamton. Her research interests focus on political parties, participation, and women in politics in advanced industrial democracies. She has published articles in Comparative Political Studies and Party Politics and is completing research on women's integration into political parties in Western Europe. Wendy K. Tam Cho is Associate Professor at the University of Illinois at Urbana-Champaign, where she holds appointments in Political Science and Statistics. She received her Ph.D. from the University of California at Berkeley. She has published articles in scholarly journals on the topics of racial and ethnic politics, statistical methods, and elections. An avid triathlete, she recently interrupted her competition schedule to produce Matthew Cho in collaboration with her husband, Lawrence. Jack Citrin is Professor of Political Science at the University of California, Berkeley. He is author of Tax Revolt: Something for Nothing in California (Harvard University Press, 1985), The Politics of Disaffection among British and American Youth (University of California Press, 1976), and the forthcoming The Politics of Multiculturalism and the Crisis of American Identity. His research interests are trust in government, nationalism and immigration, ethnic politics, and California politics and elections. Jonathan Cohen is a Ph.D. candidate in Political Science at the University of California, Berkeley, and recently served as Survey Analyst at the Public Policy Institute of California. His fields of interest include California politics, fiscal policy, and organizational behavior. Jon's dissertation about the politics and political implications of state tax policy is currently on hold while he works as Director of Product Marketing for Mobileum, a wireless software platform provider. Christian Collet received his Ph.D. from the University of California, Irvine, where he is currently a postdoctoral researcher in the Department of Political Science, completing a book on the rise of minor-party politics. His research focuses on the interaction between mass and elite behavior in the contexts of partisan and ethnic politics. He also serves as president of Pacific Opinions, an independent company that conducts polls and opinion research for local governments, media, and nonprofit organizations. Todd Donovan is Professor of Political Science at Western Washington University and defending champion of the Bellingham Pub Run. His research focuses on voting behavior, the politics of state taxation, direct democracy, electoral systems and representation, and the political economy of local development. His is coauthor of Demanding Choices: Opinion and Voting in Direct Democracy (University of Michigan Press, 1998) and coeditor of Citizens as Legislators: Direct Democracy in the United States (Ohio State University Press, 1998). His research on democracy and representation has appeared in the American Journal of Political Science, the Journal of Politics, Political Research Quarterly, Electoral Studies, and several other journals. Brian J. Gaines is Associate Professor of Political Science and an affiliate of the Institute of Government and Public Affairs at the University of Illinois at Urbana-Champaign. He has been a visiting scholar at the Department of Applied Economics at the Catholic University at Leuven. He earned his Ph.D. from Stanford University, where he was also (playing) president of the ice hockey club. His research is focused on elections, electoral law, voting behaviour, and mass and elite attitudes in modern democracies, and he has contributed to ten journals. As his spelling suggests, he remains a Canadian citizen. Elisabeth R. Gerber is Professor of Public Policy and Director of the State and Local Policy Center in the Gerald R. Ford School of Public Policy at the University of Michigan. Gerber's research is concerned with the policy consequences of electoral laws and other political institutions. She has written on the use of initiatives and referendums in California and other states and recently completed two books on the subject: The Populist Paradox (Princeton University Press, 1999) and Stealing the Initiatives (Prentice Hall, 2000). She is involved in a study of electoral laws in the American states and their effects on election outcomes and representation, and on the politics of land use and the dynamics of local ballot initiatives. She was an expert witness for the State of California in California Democratic Party v. Jones. Thad Kousser is a Ph.D. candidate in American Politics at the University of California, Berkeley, and a researcher at the Institute of Governmental Studies. His focus is on the links among electoral law, institutional design, legislative elections, and legislative behavior. His dissertation will explore how professionalization and deprofessionalization through term limits have changed the form and function of American state legislatures. Megan Mullin is a doctoral student in the Department of Political Science and a research assistant at the Institute of Governmental Studies at the University of California, Berkeley. She is interested in state and local politics, political participation, and the intersection of democracy and technology. Jonathan Nagler is Associate Professor of Politics at New York University. He has previously taught at Harvard University and Caltech. Professor Nagler's primary areas of research are the relative impact on elections of economic conditions and issues; strategic voting; turnout; and political methodology. Articles on these subject by Professor Nagler have appeared in the American Political Science Review, British Journal of Politics, American Journal of Political Science, and other scholarly journals. He was an expert witness for the State of California in California Democratic Party v. Jones. Nathaniel Persily is an Assistant Professor at the University of Pennsylvania Law School. Before joining the law school, Professor Persily was Associate Counsel at the Brennan Center for Justice at New York University School of Law, where he specialized in voting rights and election law. In addition to filing Supreme Court amicus briefs in Bush v. Gore and California Democratic Party v. Jones, Professor Persily was one of the lawyers representing Senator John McCain in his successful challenge to the 2000 New York Republican presidential primary ballot access laws. His research, publications, and congressional testimony have focused on topics of election law, the census, redistricting, voting rights, and political parties. An expanded version of his chapter here can be found in "Toward a Functional Defense of Political Party Autonomy," New York University Law Review 76, June 2001, pp. 750-824. Professor Persily is a graduate of Yale College (B.A. and M.A. 1992) and Stanford Law School (1998), where he was President of Volume 50 of the Stanford Law Review. Currently completing his dissertation on political parties and the courts, he is a Ph.D. candidate in political science at U.C. Berkeley. John R. Petrocik is Professor of Political Science and Chair of the Political Science Department at the University of Missouri-Columbia. He has authored or coauthored numerous books and research articles on mass attitudes and behavior, political parties, elections and campaigns, and survey research and analysis. One of these books, The Changing American Voter (Harvard University Press, 1976; rev. ed. 1979), received the Woodrow Wilson Award in 1977. Currently, he is working on a book that analyzes the role of candidates in setting the issue criteria with which voters choose among candidates. Anthony M. Salvanto's work focuses on American elections and voting behavior, with emphasis on initiative voting, ballot design, and electoral systems. He has recently served on the Carter-Ford National Commission on Electoral Reform's task force on voting systems and ballot access. Prior to that, Dr. Salvanto led the analysis of the 2000 Presidential election for the Miami Herald/USA Today examination of overvotes and also documented problems with mispunched ballots in Miami-Dade County. He is currently at work on a book about voter behavior on complex ballots, the 2000 election, and what it can teach us about electoral reform. He earned his Ph.D. from the University of California, Irvine (2000), and subsequently was the 2000-2001 Faculty Fellow in the Department of Political Science. Gary M. Segura is Associate Professor in the Department of Political Science at the University of Iowa. His research focus is on political representation, with particular emphasis on the representation of Latinos and other minority groups. He has published articles in the Journal of Politics, the Political Research Quarterly, the Journal of Conflict Resolution, and Legislative Studies Quarterly. John Sides is a Ph.D. candidate in the Department of Political Science at the University of California, Berkeley. His dissertation research centers on the interaction of public opinion and elite action in political campaigns. Katherine Tate is Professor of Political Science at the University of California, Irvine. She is the author of From Protest to Politics: The New Black Voters in American Elections (Harvard University Press, 1993) and coauthor of African Americans and the American Political System, 4th ed. (Prentice Hall, 1998). She is the principal investigator of the 1996 National Black Election Studies, which was funded by the National Science Foundation. She reports on these data in her forthcoming book, Black Faces in the Mirror: Black Constituents and Their Representatives in the U. S. Congress (Princeton University Press, 2002). Martin P. Wattenberg is Professor of Political Science at the University of California, Irvine. He is interested in elections and political parties, both in the United States and around the world. He is the author of The Decline of American Political Parties (1998) and The Rise of Candidate-Centered Politics (1991), both published by Harvard University Press. Most recently, he coedited Parties without Partisans (2000) and Mixed-Member Electoral Systems (2001), both published by Oxford University Press. He testified as an expert witness on behalf of the parties in California Democratic Party v. Jones, the court case that challenged Proposition 198. Nathan D. Woods is a doctoral candidate in the School of Politics and Economics at the Claremont Graduate University. He received his M.A. in American Politics from Claremont Graduate University in 1999. His research interests lie broadly in political behavior, campaigns and elections, representation, and minority politics. California's adoption of the blanket primary in 1996 presented a unique natural experiment on the impact that election rules have on politics. Billed as a measure that would increase voter participation and end ideological polarization, Proposition 198 placed California voters once again on the frontier of political reform. 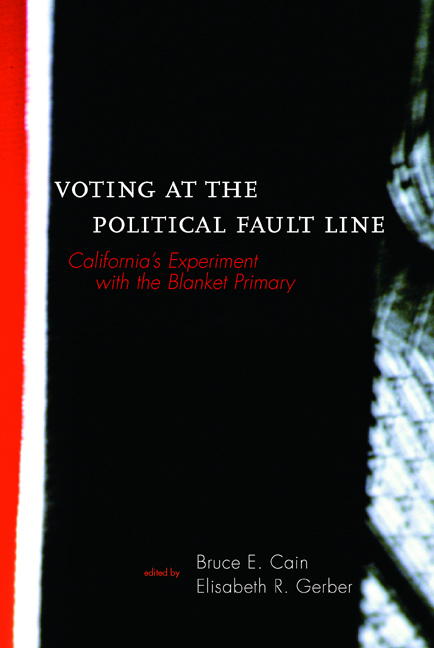 Employing a variety of data sources and methodologies, the contributors to Voting at the Political Fault Line apply their wide-ranging expertise to understand how this change in political institutions affected electoral behavior and outcomes. This authoritative study analyzes the consequences of California's experiment with the blanket primary, including the incidence of, motivations behind, and persistence of crossover voting; the behavior of candidates and donors; the effects on candidate positions and party platforms; and the consequences for women, minorities, and minor-party candidates. Bruce E. Cain is Robson Professor of Political Science, University of California, Berkeley, and Director, Institute of Governmental Studies, University of California, Berkeley. He is the author of The Reapportionment Puzzle (California, 1984) and coauthor of The Personal Vote (1987) and Congressional Redistricting (1992). Elisabeth R. Gerber is Professor of Public Policy and Director of the State and Local Policy Center, Gerald R. Ford School of Public Policy, University of Michigan. She is the author of The Populist Paradox: Interest Group Influence and the Promise of Direct Legislation (1999) and coauthor of Stealing the Initiative: How State Government Responds to Direct Democracy (2000).